Oz Content is content ideation software for content marketers and demand generation managers primarily serving B2B and high-intent B2C companies. When Oz Content broke the 15,000 leads mark, they knew they had a problem. Like their customers (also in the marketing industry), only 1% of their leads would convert into MQLs for sales. 20X increase in marketing-sourced qualified leads. 4x increase in total marketing qualified leads. Moved from 20% to almost 100% marketing-sourced qualified leads - moving sales back to closing deals, not sourcing them. Matt Lovett had a problem. 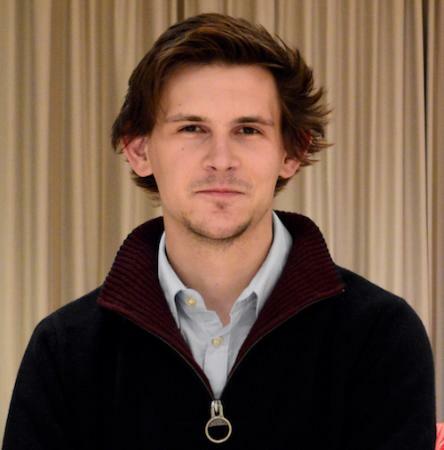 As CEO of Oz Content, he'd seen their team crack lead generation. Thanks to their website and demand generation campaigns, they were sitting on over 15000 leads, with a steady flow of 1000 new leads coming in each month. But, Matt's marketing team were struggling to convert these leads into qualified leads. As marketers, they found they were getting similar numbers to others - around 1% conversion rate. Just a small sales team, and they couldn't engage every new email opt-in with what Matt calls "hand-to-hand combat". It was really hard to see where their precious 1:1 sales time could be used. Given our product price point, which was designed for SMB customers (not enterprise), we can only scale sales when engage in SQLS, and don’t do the time-consuming hand to hand combat with TOFU leads which are really just MCL - Marketing Captured Leads for us. "We had this really big mid-funnel pile up"
Instead of scaling the sales team to run more manual outreach, Matt looked for a smarter solution to automate the middle of the funnel with marketing. With automation, he started to look into data enrichment. Data enrichment is only a raw material. It wasn't the complete answer. Though many choice data enrichment providers exist, it was a challenge to make all that data actionable in the tools they had. Oz Content weren't using anything out of the ordinary - they had a HubSpot-Salesforce stack. The problem with their core two tools is they struggle to make sense of large volumes of data for each person. Both were designed before we had such large volumes of data available. HubSpot and Salesforce become increasingly crowded visually with all this data, and it becomes hard to make sense of each profile. Both core sales tools needed data, but it becomes difficult to use and take action with that data by making them the central database. Hubspot and Salesforce both have a role to play. Using that as a central repository was not the role they needed to play. Why Oz Content ruled out enriching Salesforce with Clearbit directly. Salesforce is great for reports, reviewing pipeline, time to close, and so on - its great for "management". But it's not a great tool for maximizing throughput and optimizing how sales use their time. A clunky, complex interface, login problems, and generally taking far longer to complete any single task. So Oz decided their sales reps core activity (like engaging leads with sales and calls) wouldn't happen in Salesforce. Salesforce became largely a reporting tool, view deal volumes, projected closes, and to measure sales velocity. Since the sales team weren't going to actively use Salesforce, it didn't make sense to directly enrich Salesforce with the Clearbit-Salesforce integration. The enriched data from Clearbit was needed upstream in marketing too, but there's a lot of friction in moving that data upstream once locked into the Clearbit-Salesforce integration, like form matching between HubSpot and Salesforce. There was a lot of friction in moving data from one to the other. Neither platform was built for doing that in a flexible manner. Oz Content needed all their data from Clearbit, webinars, sales engagement, website visits in multiple places for marketing - besides Salesforce. This was incredibly clunky to manage from Salesforce. A lot of Oz Content's largest customers have access to "data lakes" and "data warehouses" - a landfill to dump your data from all your operating tools and databases - but they were far outside of Oz Content's budget. Proper data lakes cost six-figures to install, maintain, and to build querying tools to extract the right data from them. This was simply out of scope for Oz Content. But, the concept of a centralized data repository appealed to them. This would enable Salesforce and HubSpot to be cleaned up and not have to be crowded with all the data. With this idea, Matt focused his search on a centralized repository for his customer data. Oz Content looked at Segment, but found it didn't have a centralized repository. Since Segment could sync data between tools, it seemed like a solution at first. It was also much more affordable. But, Segment doesn't include a database of its own. It doesn't enable that centralized data repository, so the data would still have to live in Salesforce, HubSpot, or a custom-set up customer data warehouse. Neither of these three options were affordable or desirable. Instead of battling with Salesforce, pouring investment into a customer data warehouse, or adopting Segment to fire data between each tool, Matt found Hull through Google. Here's how they used Hull's customer data platform. Increase in total marketing qualified leads by 4x, and fix the mid-funnel pileup. Drive 2-3X increase in email open rates with hyper-segmentation. 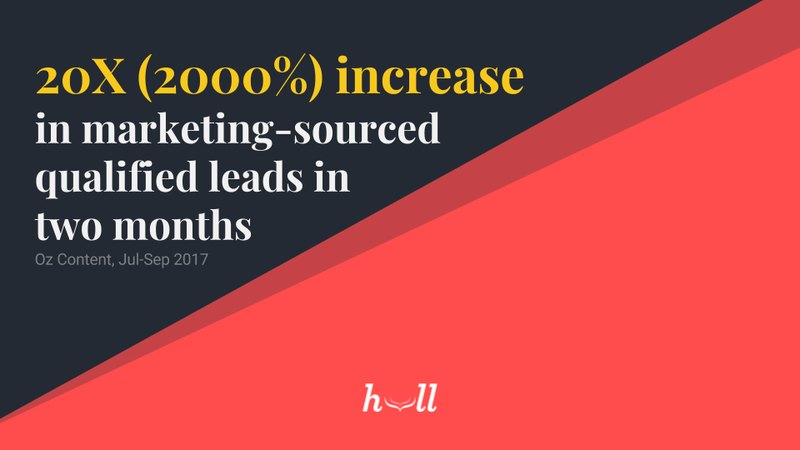 Moved from 20% to almost 100% marketing-sourced qualified leads - moving sales back from sourcing deals to closing them. Sales pipeline acceleration with personalized data and reps working only marketing qualified leads. "Hull has the abilities of a system with a six figure price tag. The biggest benefit of Hull is it is the core infrastructure we use to work off of everything." Hull connects to all of Oz Content's customer data from their core tools into one place, then combines and cleans that data into one "master" profile for each contact. 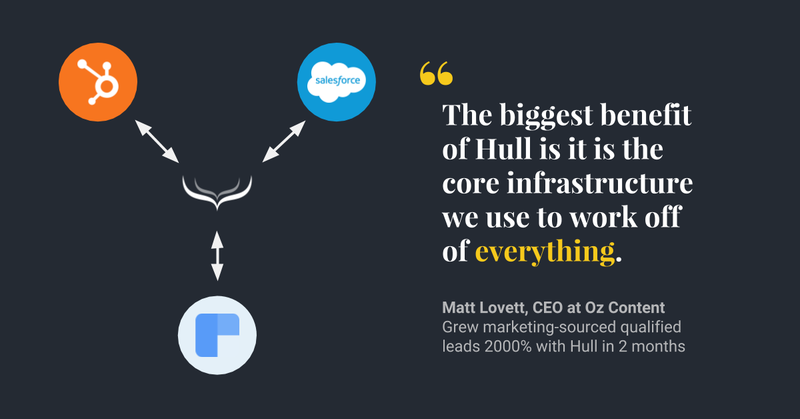 The Oz Content team could then build precise segments in Hull using data from all their different sales and marketing tools. Hull updates each segment in real-time whenever there's new data or an update at any scale and complexity - like Google Instant search for your users - unlike HubSpot Smart Lists which can take minutes or hours at higher numbers of contacts and complexity to their segments. Oz Content could then select which segments and parts of the full customer profile to sync to their different tools. Again, Hull syncs and updates these segments and profiles in real-time. Hull segments appear as "Static Lists" in HubSpot, since these are usually manually uploaded. With Hull, these will be updated faster than HubSpot-computed Smart lists. Using Hull for precise, hyper-segmentation, Oz Content could maximize engagement with their leads with ease - at about 1/20th of the cost of the next viable option (data warehousing). Moreover, Hull empowered the non-technical marketing team with data in real-time. Data that was traditionally locked up and an "IT ticket" or a "quick favor" away from the marketer being able to access. Hull walked the Oz Content team through the on boarding process from end-to-end. The MoFU Hyper-Segmentation Playbook (or how Oz Content drove 2000% growth in marketing-sourced qualified leads). Though Oz Content had thousands of leads, they needed some way of engaging them before they could mark them as qualified and cue in sales. But the marketing team was wary of sending more (MOAR!) messages. They didn't have a content strategy which set their leads expectations to hear from them regularly - like a daily newsletter. "Don't over-touch your customers, unless they bought into this daily or frequent messaging." Instead, they wanted to focus on occasional touches - "they don't get more than one touch per week" - with high relevance and value. They wanted to focus on quality nurturing, not quantity. To do this, Oz Content identified clusters of contacts with similar traits which indicated they may have similar problems. "I know you've got specific problems, and I've got customers like that where I can say something that can actually help you out. That's really cool because people are like "this is awesome! That's exactly our problem!" and they don't mind getting those types of emails." Using their own data and experience, they could create webinars that focused in one those identified, niche pain points. But this precision MoFU content needed people to see it. Instead of sending generic, send-to-all spam, Oz Content would only email leads about the content they'd be most likely to be interested in. This resulted in a 2-3x increase in email open rate from an average of 21% to 40-60%. This also kept their 15,000 pool of leads from unsubscribing, since they weren't often presented with irrelevant content that was worthless to them. An unexpected side effect of the hyper-segmented emails to teams is the increase email forwarding - part of the 400% increase in conversions from lead-to-opportunity. We had a 400% increase in conversions from Lead to Opportunity running this type of email campaign vs. pre-Hull. A big part of it is the (I think very overlooked) effect of the internal email forward”. OzContent found leads would forward these highly-focused webinar invitations around the company and see many more account stakeholders become aware and engaged with OzContent deep down the marketing funnel. It is also a very defensible content strategy. Only Oz Content, with their enriched, leads database could produce and deliver this hyper-targeted, hyper-focused content. Without this data, competitors have to go broad, generic, and add less value. They can't identify or attract this specific audience so directly and easily. By raising their proverbial hands for these hyper-specific webinars, Oz Content could identify intent very accurately, as well as fit (from their data enrichment), and pass off deeply qualified, hot leads to sales. "Prior to Hull, we would get a lot of qualified leads. We'd qualify them based on different criteria, but we weren't doing a great job of capturing intent." Finally, there were huge gains in sales efficiency. Hyper-segmentation is content intensive - each webinar takes a significant amount of work to put together. But, if you've already got a large volume of leads, it is far more efficient to use the MoFU hyper-segmentation playbook than deploying sales higher up the marketing funnel. Oz Content uses Salesloft as their sales cadence tool. They'd used SDR driven growth, which made sense in the early stages when marketing hadn't started to deliver the large volume of leads. In the beginning, SDR cadences delivered the first-to-last mile for driving sales opportunities. But now with the high lead volume and the MoFU hyper-segmentation playbook, sales sourced leads were redundant. It was far more efficient to focus the time of the sales team on nurturing the marketing-sourced qualified leads. Salesloft became a last mile tool, and sales could focus on sales acceleration too. This also conformed better to the team's values. As marketers, Oz Content wanted to practice what they preached and deliver value with helpful content upfront. This is far more challenging to execute with the channels usually used for outbound email. Furthermore, with marketing-sourced qualified leads, sales were empowered with the full, enriched profile of each person so they could deeply personalize their sales outreach. The MoFU hyper-segmentation playbook would not have been possible without Hull. With the data that marketing needed in the tools that marketing used, without IT, without six-figure budgets, and without complexity, marketing was able to execute a deeply data-driven campaign. Hull combines data across all your sales and marketing tools, including data enrichment. See how it works, or book your personalized demo. Don’t have data enrichment yet? Get in touch, and we'll walk you through setting up Clearbit with Hull. You’ll see enriched data across your entire sales, marketing, and customer stack in moments.